In our previous post, we provided an overview of what cryptocurrencies like Bitcoin are and how they work, including the use of blockchain technology. Now, it’s time to talk about what this all means for Winnipeg, and how Economic Development Winnipeg is here to assist. Need a refresher on cryptocurrency and blockchain? Be sure to read our previous post on these topics before continuing on. Because cryptocurrencies use blockchain technology, transactions (who bought and sold each unit of currency at what time) are validated on multiple computers simultaneously. That reconciliation requires a massive amount of data, as validation needs to happen constantly for the process to work. In order to reconcile all these transactions, people who collect Bitcoin (known as ‘miners’) need to have computers running 24 hours a day – in short, they need a data warehouse. Running a cryptocurrency mining program used to be feasible from a miner’s residence, but that is no longer the case. The sophistication of the technology required has increased to the degree that it’s essential to run multiple computers simultaneously in order to mine successfully. This requires a specialized environment and commercial servers. In short, it is now essential for miners to have a commercial-grade mining operation, which means they almost always require a dedicated site. 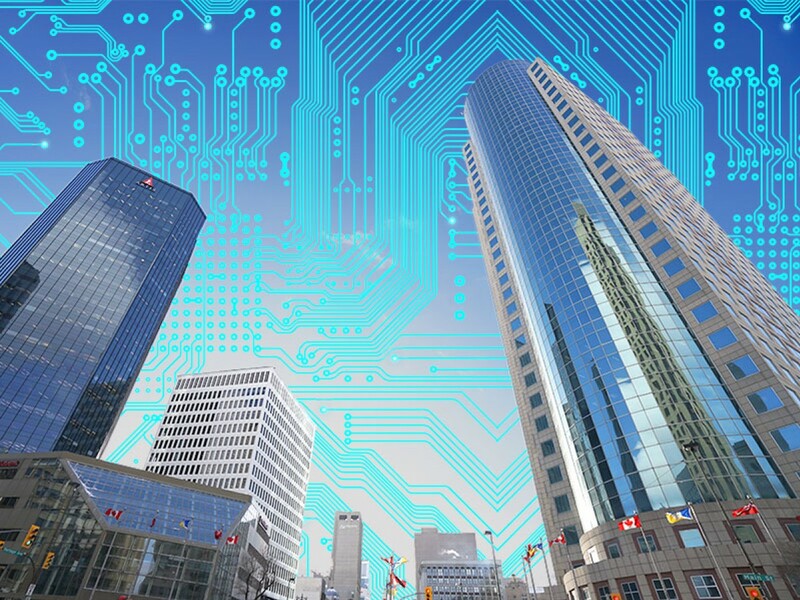 What does the need for data warehouses have to do with Winnipeg? The solution has to do with the benefits our geography and economy can provide to these industries. Data warehouses consume an incredible amount of energy to keep their facilities cool, so as not to risk overheating. An inexpensive solution to this problem can be found in Winnipeg: our climate can naturally cool data warehouses for a significant portion of the year, while our utility costs (some of the lowest on the continent) creates lower operating costs than almost anywhere else. Include inexpensive real estate prices and very competitive salary levels in the ICT industry, and Winnipeg becomes one of the best places in the world to set up a business that uses blockchain technology. It’s impossible to speculate on what will happen to cryptocurrencies in the next few years – some economists believe this to be a fad and that the bubble will pop while others see Bitcoin as the next global currency standard. However, there are many applications for blockchain technology that seem likely to grow in importance and usefulness in the coming years. Companies are now developing both public and private blockchain to validate and secure information on a global scale, protect intellectual property, and certify transactions between users anywhere in the world. The camera company Kodak is an example of a company that is reinventing itself with blockchain technology. Kodak recently announced the introduction of a KODAKcoin, which is a cryptocurrency that helps photographers protect and license their images and intellectual property. Using this system, any image uploaded to Kodak’s platform will use blockchain technology to monitor the web, sell images and flag anytime an unauthorized copy of an image is used. KODAKcoin allows photographers to receive payment for their licensed work on a secure platform. Blockchain technology has many applications that will likely be commonplace in the near future. Smart contracts can use blockchain to validate the authenticity of a document when it is signed, while removing any possibility of tampering with a contract after the fact. Blockchain can greatly enhance cybersecurity to remove a hacker’s ability to hold information hostage or destroy information, while removing the risk of fraudulent documents. Companies are working on using blockchain to protect electronic health records while increasing the ability for authorized professionals to access those same records instantly. Many other applications are in development – cryptocurrency is only the beginning of blockchain technology adoption. A new network startup called Golem is using blockchain to distribute computing power. Golem’s network allows computing power from any desktop to be distributed over an anonymous network, with that power being sold to other computers who need it to complete a specific task. Users connected to this system can sell their computing power on the Golem distributed network, with each transaction earning a commission paid in Ethereum cryptocurrency tokens. These contracts are validated using blockchain, so that every transaction is secure. Blockchain looks certain to have long-term growth potential in multiple industries worldwide. In fact, some forecasts have blockchain technology accounting for 10 percent of global GDP by 2025. As these applications start to become more common, the need for more data warehouses will grow – and Winnipeg is on the world’s radar as a place to set up these cutting-edge businesses. We have the geographic space, available real estate, and affordable utility costs to host an incredibly high number of warehouses – and we are ready to welcome companies from across the globe to set up their blockchain and cryptocurrency operations here. If you're a company looking to set up a cryptocurrency or blockchain operation in Winnipeg, contact our YES! Winnipeg team and let us help you understand how we can assist in getting you started. Our organization can provide you with confidential, practical advice on how you can ensure your next data warehouse is set up to succeed. For more information on the services we provide, please visit our website.